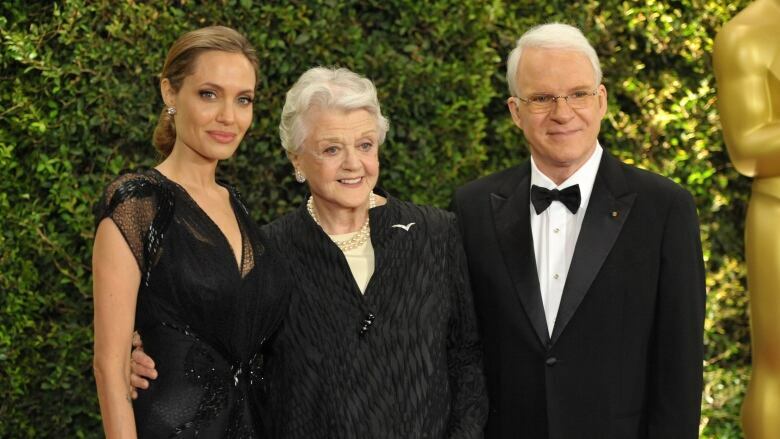 Angelina Jolie, Steve Martin and Angela Lansbury were moved to tears at the film academy's fifth annual Governors Awards. Each of the entertainers accepted honorary Oscar statuettes Saturday at a private dinner at the Hollywood & Highland Center. Italian costume designer Piero Tosi was also honoured, but did not attend the ceremony. Jolie received the Jean Hersholt Humanitarian Award. Before guests including Brad Pitt and a man Jolie cited as "my hero," WWII veteran and Olympian Louis Zamperini, the 38-year-old actress-director became emotional as she thanked her late mother, whom she said inspired her to think of others and give back. "To stand here today means I did as she asked," Jolie said. "And if she were alive, she'd be very proud." Tom Hanks and Martin Short helped present Martin with his honorary Oscar, which Short described as "the highest honour an actor can receive in mid-November." Accepting recognition for his distinguished career, Martin said, "I can't possibly express how I excited I am tonight, because the Botox is fresh." But the 68-year-old got misty eyed as he reflected on the dear friends he's made during his five decades in film. "I knew I wasn't going to make it through this speech," he said. "I read it to my dog this morning and wept." Lansbury recited a list of her famous co-stars as she accepted her honorary Academy Award: Ingrid Bergman, Bette Davis, Frank Sinatra, Katharine Hepburn, Clark Gable, Lawrence Olivier and Orson Welles. With her two brothers, three children and three grandchildren in tow, the 88-year-old actress' voice cracked as she thanked movies and acting for rescuing her after the death of her husband. She said sharing the Governors Awards ceremony with her family was better than "shivering with hope" during her three Oscar nominations, none of which resulted in statuettes. "You can't imagine how happy and proud I feel, really undeserving of this gorgeous golden chap," she said. The crowd inside the Ray Dolby Ballroom was like a who's-who of the upcoming awards season. Besides guests such as Diane Keaton, Octavia Spencer, Geoffrey Rush, Emma Thompson and Harrison Ford were stars of some of the year's most acclaimed films, including Michael B. Jordan of "Fruitvale Station," Idris Elba and Naomie Harris of "Mandela: The Long Walk to Freedom," Chiwetel Ejiofor, Lupita Nyong'o and director Steve McQueen of "12 Years a Slave," Matthew McConaughey and Jared Leto of "Dallas Buyers Club" and Amy Adams and director David O. Russell of "American Hustle." The Governors Awards were not televised but portions of the ceremony may be included in the Academy Awards telecast on March 2, 2014.